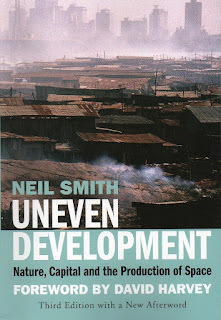 Neil Smith's Uneven Development is a classic work of Marxist geography that deserves to be read by everyone trying to understand the way that capitalism shapes, and reshapes the natural world. Smith's central thesis is that capitalism has transformed the natural world, but it has also transformed our "social relation with nature" in unprecedented ways. "The concrete form taken by this metabolism may change historically... In the pre-bourgeois era, 'man is as yoked to his natural existence as to his body,' and there there is an 'original... abstract identity of man with nature.' With the emergence of bourgeois conditions of production, this identity changes into its equally abstract opposite; the radical divorce of labor from its objective natural conditions." Where capitalism is unique is that for the first time human beings produce nature at a world scale. Hence Marx's brilliant observation, over 120 years ago, that 'the nature that preceded human history... today no longer exists anywhere (except perhaps on a few Australian coral islands of recent origin)'. Smith has, however, a sense of the alternative to this. That in the process of struggling against capitalism, the working class has the potential to "truly define human nature". The working class itself is unnatural, a product of capitalism. The victory of that struggle would bring a "historically unique opportunity for human beings to become the willing social subjects not the natural subjects of their own history." Smith then takes his explanation of the production of nature into a discussion of the production of space. In earlier societies he argues, there was no differentiation of "space" from matter, force or power. There was a "unity of nature... space, substance and meaning were one". But our concepts of space change historically, the "spatial form of the capitalist city, for example, is quite different from the feudal city". Under capitalism, space becomes a commodity, and this is not restricted to the creation of "physical space", but "the production of space also implies the production of the meaning, concepts and consciousness of space which are inseparably linked to its physical production." Rather neatly Smith explains that in "Euclidean terms" the height of an apartment in a block of flats might be equivalent to the height of a tree, but the "distance between floors of the tenement can also be measured in terms of social rank and class, whereas the height of the tree cannot". Or, consider how under feudalism the serfs were tied to the land, so a definition of class relations also included a definition of the absolute space of the peasants work. Smith analyses the development of capitalism in the later part of the book. He places particular emphasis on the way that capitalism is founded upon the division between town and country, industry and agriculture. This doesn't begin with capitalism, but is inherited from the developing capitalist relationships under feudalism. The separation of town and country becomes the foundation for capitalism. In turn, capitalism reshapes the world "after its own image". This doesn't simply mean that capitalism reshapes nature in its image and for its interests, but "the dynamism of geographical space is equally an expression of the image of capital." The tendency of capital to centralise and create monopolies, the tendency for the system to leap upon areas where new markets are to be found, or new profits to be made, creates an unequal, uneven capitalist space. Capitalism creates unevenness within itself, and this is reflected in the unevenness of the system around the world, but also in social inequalities - rich and poor, cheap and expensive housing. And, in a powerful comment, Smith points out that uneven development of capitalism is at the heart of imperialism - "uneven development, thy name is war" he writes. Abolishing this inequality is not simply a social struggle, Smith argues, but a "geographical project". This might sound strange to those of us thinking of geography as a school subject about rivers and mountains, but Smith is putting across the idea that capitalism is a system that shapes and creates space on an enormous scale, and it can only be challenged on that scale. In the afterword to the third edition, published a few years before his death. Smith points out that unevenness has only got worse since the book was first published. "The pay of CEOs in 1982 in the US was 42 times that of wage workers.... it has risen to an astonishing ratio of 364:1". Unusually for an academic, Smith doesn't abandon his belief that things can be changed, concluding that it "may not be too optimistic to begin again to encourage a revolutionary imaginary". 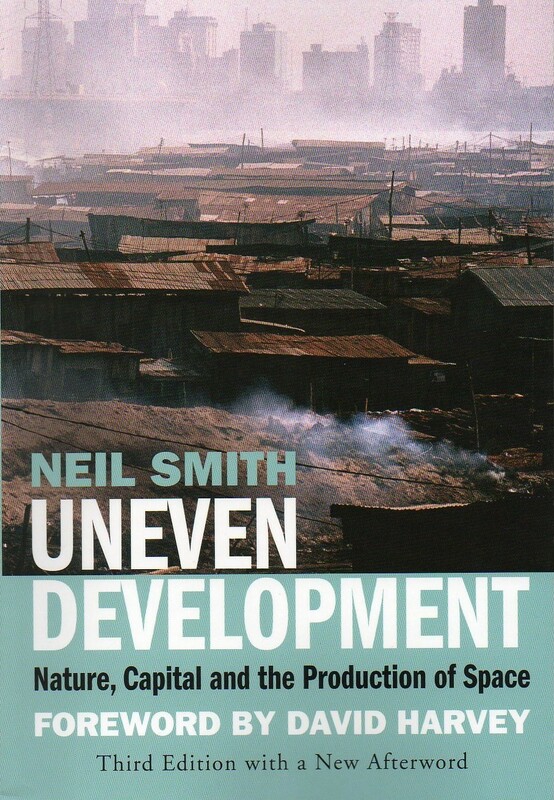 While this is not an easy book, and covers some complex and difficult ideas, it is an important one, and Neil Smith deserves reading to do just what his conclusion suggests, encourage a revolutionary vision.